My brother Buster is moving overseas in a few days. He, Birdie and I went to our Nonna and Nonno's house on New Year's Eve for a farewell lunch. 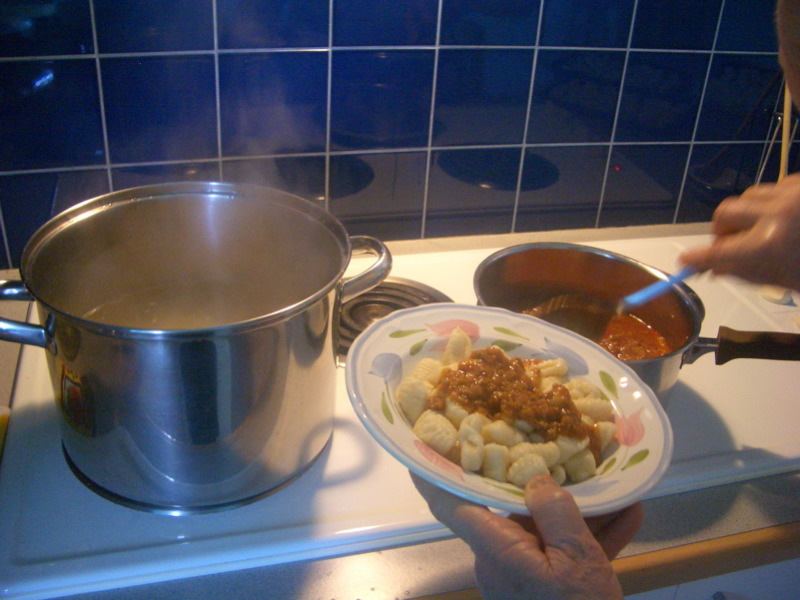 The guest of honour was allowed to choose the menu - without hesitation, Bus had asked Nonna to make gnocchi with sugo... our all-time favourite of her dishes! Despite the obvious lunacy of a hot meal in forty-bloody-two degrees celsius heat we proceeded and (of course) Nonna turned it into a four course epic. Mamma mia! 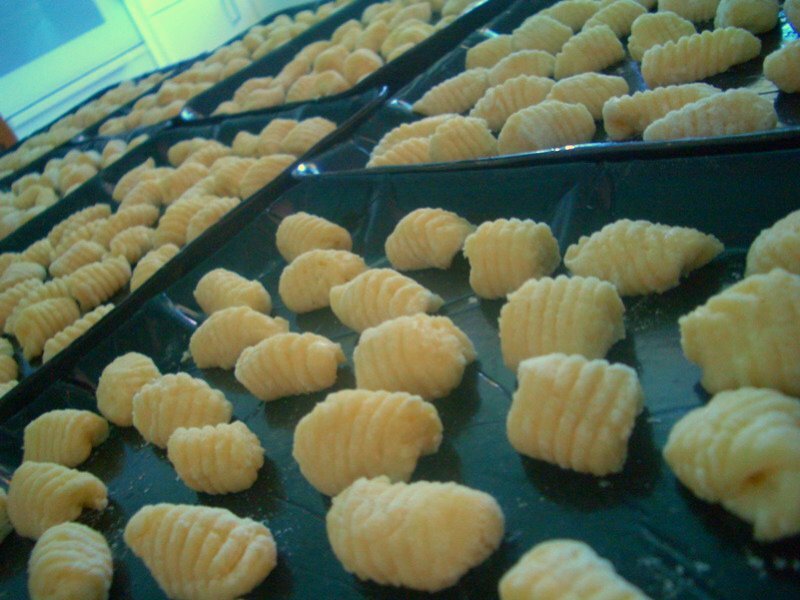 Nonna certainly had been busy that morning, preparing tray after tray of the world's softest gnocchi di patate (assisted in the rolling stage by Nonno). 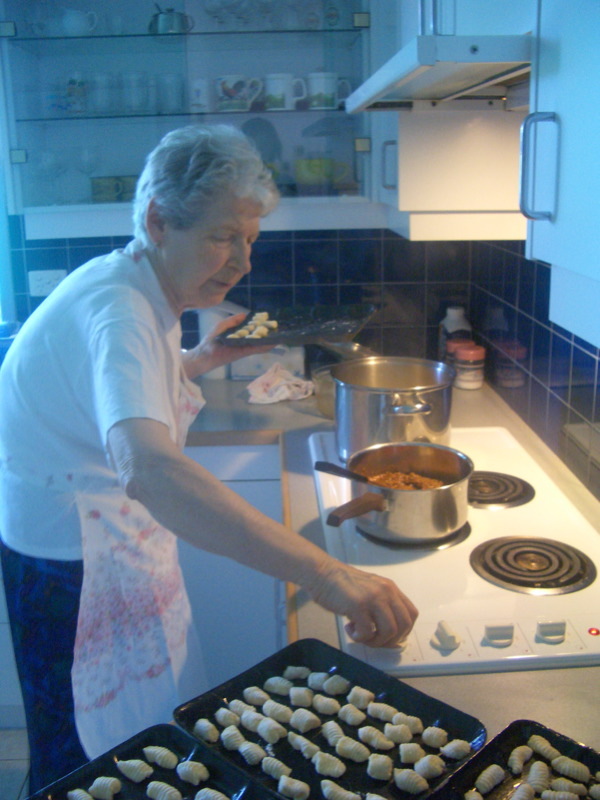 Nonna boiling the gnocchi in her spotless kitchen (tinted blue because the blinds were lowered to keep out the heat). 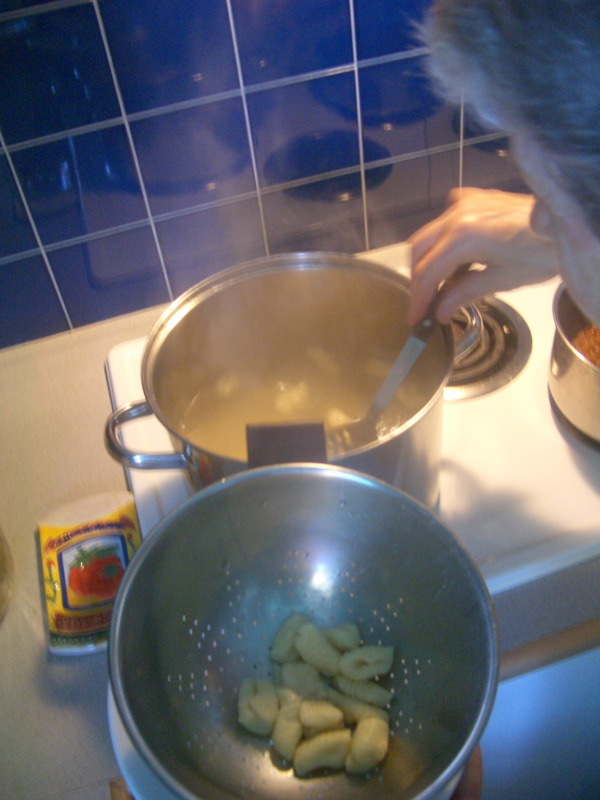 Fishing the gnocchi out of the boiling water with a slotted spoon as they rose to the surface. My Nonna wouldn't ever DREAM of having guests over and giving them "just" a pasta course. 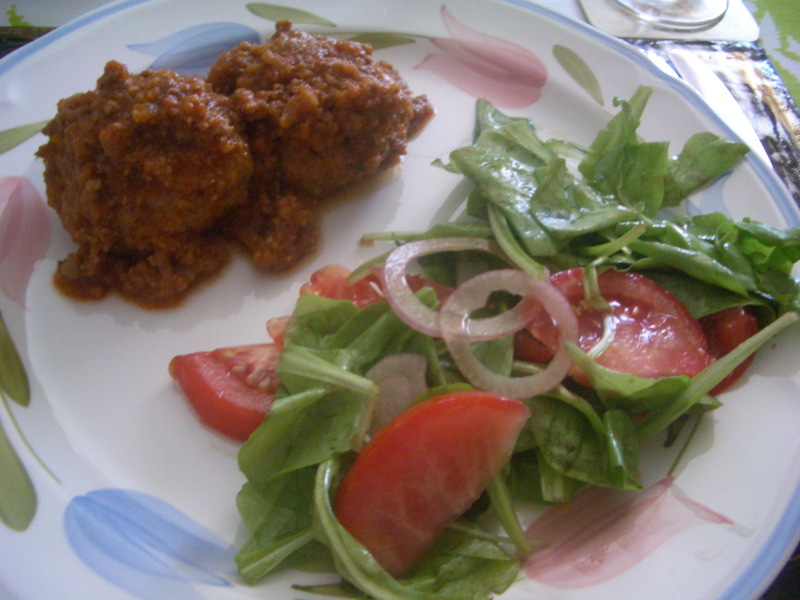 So the secondo piatto was polpette (meatballs) in leftover sugo, plus a salad featuring radicchio bianco triestino (wonderfully bittersweet) plucked from Nonno's garden just before we'd arrived. Next came the obligatory cheese course. 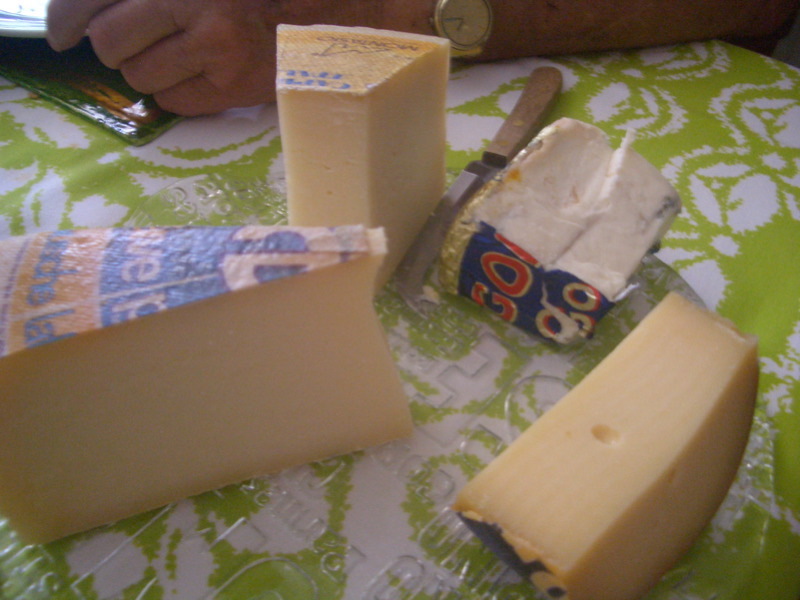 Apart from the Gorgonzola, Nonna and Nonno prefer hard cheeses, so we also had Piave, Montasio and Prima Donna. 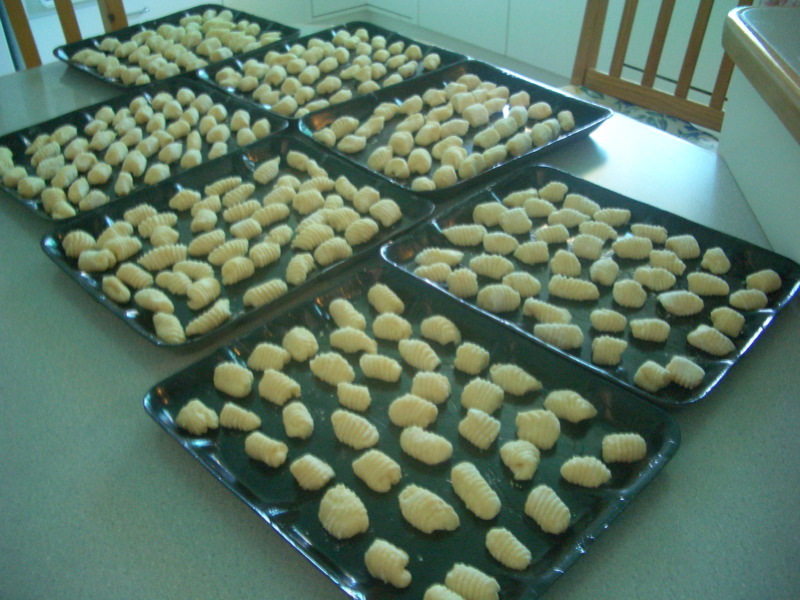 I was going to type up my notes on Nonna's recipe, but as I was writing this blog entry, my Google Reader account informed me that mellie from the blog Tummy Rumbles has this very afternoon written a fantastic entry on making traditional gnocchi di patate! Nonna's recipe and preparation method is virtually identical, except for the fact that Nonna waits until the salted potato moosh is cold before mixing in the other ingredients, and uses 2 eggs to 4 potatoes. happy new year to you and yours too claire! 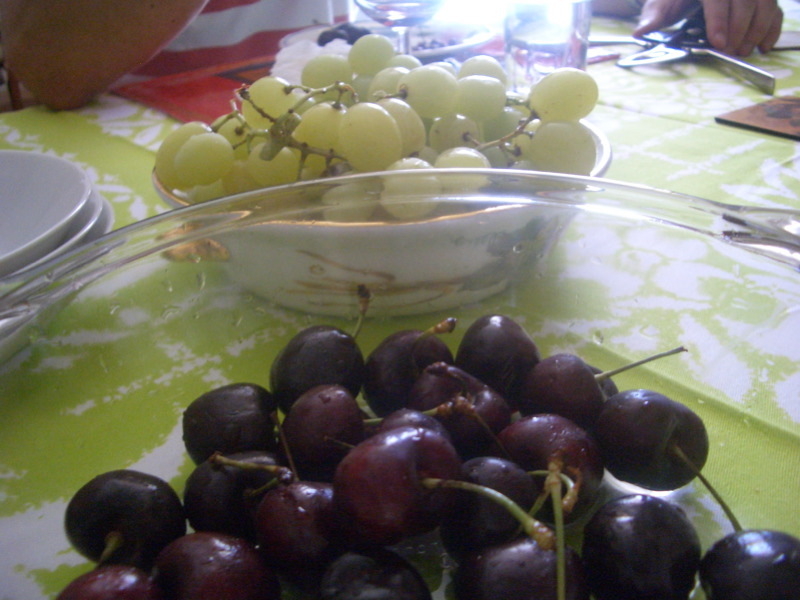 speaking of cherries, we saw some for $5/kg at the vic market today! But what a wonderful post you wote! You are so lucky to still have a Nonna and Nonno in your life. Treasure every moment you have with them! Well hello Melbourne Gastronome. 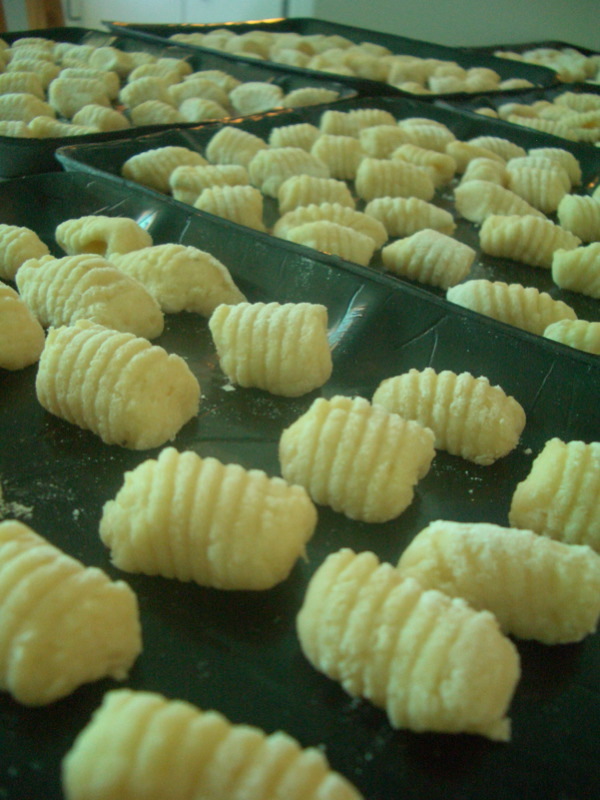 Those photos of the gnocchi look amazing and you have some wonderful recipes on your blog. Hope you don't mind if I add you to my blog. A friend of mine recently drew my attention to your claim that I am a 'fake lawyer'. Please be assured that I am indeed a real lawyer and work for a BCF. And yes, life in a big firm is as it reads. I have battle scars from hours of boring law tutes with people asking tedious questions to prove it too. trixie allan: Well hello to you too! Thank you for your kind comments about my blog and I certainly don't mind if you add me to yours. I also apologise if my reference to your blog as a "fake lawyer blog" caused any offence - I have amended the reference. Mutemonkey, fear not, no offence has been caused. I am quite intruiged to hear that you and your friends think that my stories are wildly embellished. I don't quite know what to say. I am not offended at all becuase I know that I can 100% assure you that every story I have placed on that blog is as the result of my law firm experiences. Especially the Christmas party one. Do you think I could possibly make something like that up? Your BCF is obviously a little more established than mine. Re confidentiality clauses, they only apply to files we officially handle, not secret ones I do for a partner's mate. There is the issue of privilege but using VGM instead of his real name fixed that problem. What a wonderful blog you have, Melbourne Gastronome. I chanced across it in looking for a recent review of Hako, and I must say it's terrific. I love your Nonno and Nonna - they remind me so much of my best friend in Italy's grandparents and the gnocchi look just perfect. I, too, am a lawyer working at the King Street end of town and so I could entirely relate to your quest for decent places at lunchtime. 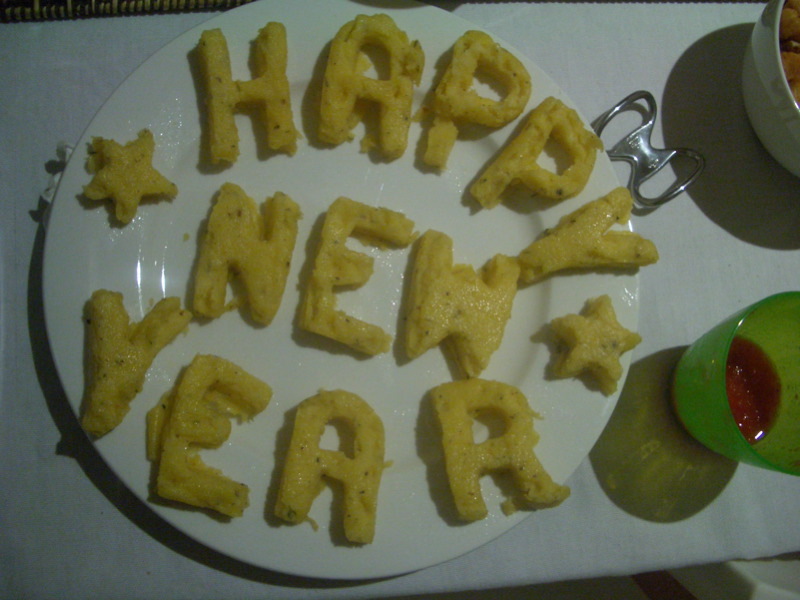 Congratulations on your blog (it's the first food blog that I have ever read)! Your passion for good food treated with respect but without snobbery is inspiring. Perhaps we may bump into each other at the Vue de Monde cocktail do in the coming months. P.S. Any suggestions for the next installment of my King / Bourke Quest? P.P.S. I love my Nonna and Nonno too! Wanted to make some gnocchi myself over the week-end, but settled on making orecchiette (or "chiancarelle" as a friend who comes from Taranto insists on calling them) with zucchini - a staple from University days in Florence. re: P.S. - I think you've just about covered the market. I haven't found anything nearby that is better than the trevally wrap at Ilia and most things at Cafe Vue. Otherwise I generally try to walk to Superfino, which is consistently very good. (I don't think you've written that up yet, though you may recall Matt Evans' piece about it in Epicure a few months ago.) With a bit more time, either Gill's Diner or Journal Canteen. Incidentally, I found Hako a disappointment. On a moderately busy day we sat down at one and were not served until one forty. The food was fine, but I did not think that it was interesting enough to justify the prices. The sashimi at Don Too (?) in Little Lonsdale Street is, in my opinion, just as fresh and excellent at a quarter of the price. Still, I'll give it another go one evening. Dish of the month so far (apart from the orecchiette!) was the grilled lemongrass chicken special at Binh Minh last night. Very light and unexpectedly subtle. I think that the bar nights at Cafe Vue do not re-start until early February. I'll be starting this Friday night with a bottle of something pleasant at Wine Shop in Spring St. The Binh Minh chicken and chiancarelle sound great, Andrew (I want to see them! Start a blog!)... when I was at Uni in Siena my favourite Tuscan pasta was pici. Have you tried it? Sorry to hear Hako was underwhelming, but hey I certainly share your love for Don Too sashimi, as you can see from my post on it! Finally, enjoy the Wine Shop tomorrow night - it's one of my best friend K's favourite places up near her work. I had a great Zin there recently! Come no? I pici all'aglione e' uno dei miei piatti toscani piu' preferiti (insieme con pappa al pomodoro e ribollita). Diciamo che non e' una delicatezza; pero' e' un piatto semplice, onesto e tipicamente senese e percio' molto apprezzato. I mentioned it before, but I can I just re-emphasise how much I love Gill's Diner. Con Christopoulos deserves an Order of Australia for making our lives so much better. He just really gets it. I had a quick lunch there yesterday and it was absolutely perfect: service, ambience and, most of all, the food - chicken and mushroom pie with a little salad of radicchio and rocket dressed with olive oil, white wine vinegar and good salt, accompanied by a glass of grecanico from Sicily, followed by a (shared) caramelised pear gobbler and Romcaffe coffee. I was singing on the way back to the office. Have you made it there yet, and, if so, could you do a post on it? Ho pranzato li' (o, come dicono i fiorentini raffinati, "ho fatto colazione"), con un amico anche oggi. E' diventata una piccola ossessione, me ne rendo conto. Ma che si fa se si mangia cosi' bene? Manca un'altra oretta sola prima di Wine Shop. Buon divertimento anche a lei, signorina.